The Flag Company, Inc., parent company of ToothpickFlag.com, the largest online supplier of flags and flagpoles, today announced its preparation for the huge 2016 Summer Olympics with increased production and availability, adding to an already vast inventory of international flags. From August 5 – August 21, a record number of countries, athletes and spectators will descend upon Rio de Janeiro for what promises to be the earth’s greatest display of international pride to- date. World Toothpick Flags are a festive way to dress up and patriotically punctuate any gala Olympics affair. 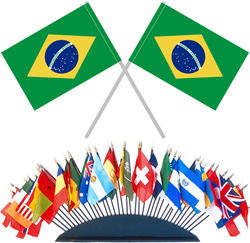 Representing virtually every country on the planet, from North America, Central America, South America – of course, Brazil – Europe, Asia, Africa, Middle East, Australian Area, the Caribbean and South Pacific, World Toothpick Flags perfectly express and are symbolic of the festive Olympics’ international spirit. World Toothpick Flags, sturdily constructed and proudly made in the U.S.A., come in Standard size 1” x 1.5” mounted on a 2.5” toothpick, or Jumbo size 2.5” x 4” mounted on a 10” toothpick for larger items. Standard size Toothpick Flags are available in 100 packs, or Econo 50-packs. The Jumbo size Toothpick Flags come in 12-flag packs. Bulk pricing and new lower price shipping options are available, especially considering new, substantial inventories on-hand. For larger needs, events or venues, The Flag Co., Inc. boasts a huge lineup of international flags including Outdoor World Flags, Indoor World Flags, Hand Held World Flags, World Stick Flags, and U.N. Flag Packs. The Flag Company, Inc. has been establishing itself for over 25 years with Spirit Flag and Toothpick Flag marketing programs, among many other innovative, timely promotions. These special marketing campaigns are representative of The Flag Company, Inc.’s commitment to being at the forefront of flag and flagpole web marketing commerce, and this year’s Olympics makes the World Toothpick Flag and World Flag promotion all that much more pertinent. Since establishing itself with the Spirit Flag and Farming Flag®, The Flag Company, Inc. has led the industry with such products as Feel Good Light-Ups and, more importantly, its patented Flagpole Beacon. Recognized as the only real innovation in the flagpole industry in the last 50 years, the Flagpole Beacon is offered in the Illuminator Series Flagpoles and also for single sale retrofits for existing flagpoles for commercial and residential customers. It is available in a solar configuration and has achieved both IDA and ETL certification.